"There Are Signs Of A New Great Awakening"
According to pastor Greg Lauri, the last great spiritual awakening of America was the Jesus movement, about 40 years ago. Some would claim that other revivals followed this one - but we might agree that we don't see those massive revivals like in the past. So, we can learn from the history. A few years earlier, an April 8, 1966, Time magazine's cover posed this question: "Is God Dead?" What a difference a few years can make, especially when God intervenes. Five years later, a 1971 issue of Time described a spiritual awakening: "Jesus is alive and well and living in the radiant spiritual fervor of a growing number of young Americans. ... If any one mark clearly identifies them, it is their total belief in an awesome, supernatural Jesus Christ, not just a marvelous man who lived 2,000 years ago, but a living God." The words "revival" and "awakening" are often used interchangeably, but there is a distinction. An awakening takes place when God sovereignly pours out his Spirit, and it impacts a culture. That is what happened during the Jesus Revolution, and it's what happened in multiple spiritual awakenings in the history of the United States, predating its establishment as a nation. A revival, on the other hand, is what the church must experience. It's when the church comes back to life, when the church becomes what it was always meant to be. It's a return to passion. I think many times we overly mystify the idea of revival, but we don't really need to. Another word I could use for revival is restoration—restoring something to its original condition. If I'm cruising down the road and see a cool, classic car that has been restored to showroom condition, I think, "Wow, that's beautiful! Someone took time to do that." That can happen in a life as well. And it's what the church needs. "Let a few of God's people, they don't need to be many, get thoroughly right with God themselves—the rest will count for nothing unless you start right there; then let them band themselves together to pray for a revival until God opens the heavens and comes down. Then let them put themselves at God's disposal to use them as He sees fit. That will bring a revival to any church, any community." Let's review: 1) Get right with God, 2) get together with other Christians and pray for revival and 3) make yourself available to God, especially in winning souls. Spiritual awakening, that outpouring of the Spirit, is up to God. We can't organize it, but we can agonize for it in prayer and call upon God to send it. What are some signs of revival? One of them is that people are hungry for God's Word, the Bible. We don't worship the Bible; we worship the author of the Bible. The Bible is the autobiography of God, so as we read the Scriptures, we discover him. I still have my Bible from those Jesus Revolution days. It was my first Bible, and it's all marked up. There are little handwritten notes in the margins, and tape is holding some of the pages together. I happen to like worn-out Bibles, because it's been said that a Bible that is falling apart is a good indication of a life that isn't. Jesus said to the church of Ephesus, "But I have something against you, that you have abandoned the love you had at first. Remember therefore from where you have fallen. Repent, and do the works you did at first, or else I will come to you quickly and remove your candlestick from its place, unless you repent" (Rev. 2:4-5). In these verses we find the three R's of getting right with God, the three Rs of having a spiritual revival personally. First, remember. Were things different before? Was your faith stronger before? Remember that. Mark it. Second, repent. Change your direction. Do a U-turn. And three, repeat. Do those things you used to do. Remember from where you have fallen. Revivals don't last forever. They have a beginning, a middle and an end. A revival is a little bit like an explosion, kind of like a starting car. But then sometimes we lose sight of it, and we need another revival and then another one. 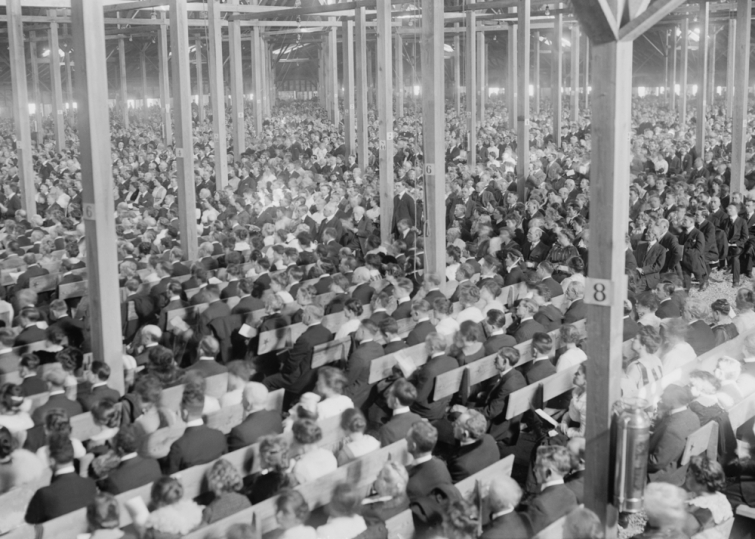 Someone once asked the evangelist Billy Sunday whether his revivals lasted. He replied, "No, neither does a bath. But it's good to have one occasionally." It's good to ask God to revive us again and again. I know that I need constant revival. You do, too. We all do. Looking back on the late 1960s and early 1970s, I see a lot of parallels between then and now. I've recently read a lot of interesting articles about this, which note the similarities. It was a divided nation back then. Things were very dark. But when things are very dark, God's light can shine brightly. I think we're due for another Jesus Revolution.